For the past few years, I’ve been using my Goodreads account to not only keep track of the books I have been reading, and not only to gather recommendations from my friends, but also, to be challenged to read. Sure, numbers don’t tell the story (so to speak), but I do like the Reading Challenge that you can set for yourself on Goodreads. 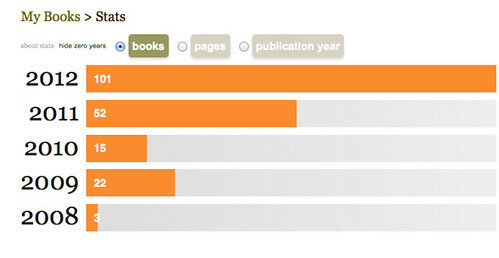 I like that Goodreads also keeps some stats on the reading. The screenshots above show the books that I read but also, tracks how it compares to the last few years. Honestly, I am not sure I would have even realized how much I have been reading if not for Goodreads. I read twice as many books as last year! This shows the page totals, and that number of pages that I read in 2012 (32,000 pages!) is pretty astonishing to me. Some of the earlier years are not quite legitimate because I wasn’t as diligent with Goodreads as I have been in the last two years. So, now I am thinking of 2013. 105 books? You bet. What about you? Thank you so much for this! I was looking for this kind of information. It looks like I can’t access it from my iPad app. Can’t wait to get on my computer and figure out my what I read in 2012. My goal for 2013…113 books. I didn’t know I could do that on Goodreads, so tomorrow I am going to do that! I lead a double life! I have one account for my ‘teacher’ reading, where I interact also with my students, and I think I read about 75, thanks to the nerdy readers on twitter. I will set 52 for 2013 and see where I get. I have a personal account as well and I am going to set about 100 for 2013. I have even in my enthusiasm started my own personal reading book blog and joined a few challenges for 2013. Setting it all up has taken awhile, but at least it gets me away from Gamestar! !